144 (h) x240 (w) x 80 (d) in. Enamel and gold leaf on mylar, 42 H x 4 diameter in. 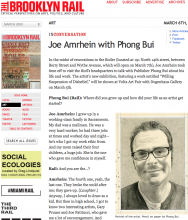 The work of Joe Amrhein is a combination of different disciplines. Physically it comes out of painting, but the context is conceptual. 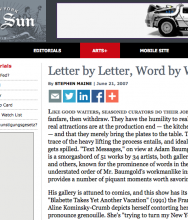 Using text and font icons as his primary subject, the source for much of the text in Amrhein's earlier work was appropriated from critical art writing. Amrhein sifted through these texts (primarily monthly periodicals like Artforum, Art in America, Flash Art, et cetera.) to pull out the hyperbolae; key phrases that attempt to elaborate on the where, when, and how aspect of the art they are describing. Caught in the parameters of language and writing, these phrases sometimes seem ridiculous, especially when taken out of context. Often people assume that he was making fun of the critics. Actually, but the artist finds much of the selected hyperbolae almost poetic. One of the main reasons for using this kind of text was not to isolate it or make fun of it but to bring it back into the art making process—making art from critical prose by critical pros. 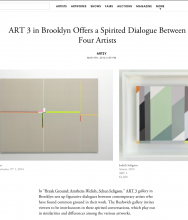 The notion that this language replaces the art it describes—replacing an idea or something concrete with abstract language—is very interesting to the artist, but bringing this abstract notion of language back into a visual art is even more interesting. Quoting Robert Smithson, “One must remember that writing on art replaces presence by absence by substituting the abstraction of language for the real thing.” In recent years, Amrhein has been working with translation, interpretation, and misinterpretation of language. Some of the text he composes is not intended to be read literally but becomes almost an artifact, because it is so highly fragmented. 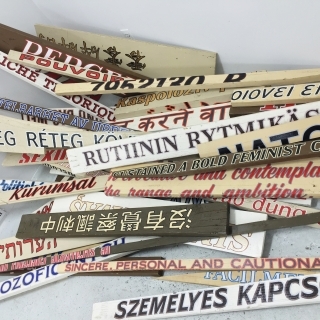 The use of sign painting influences and techniques to give this language scale and vitality comes out of my background as a sign painter. It also allows the artist to explore the issue of scale with impunity. He can develop the work to any size because of the reality of signs and their multiple use. The materials that Amrhein paints on – glass and vellum, among others – besides being traditional surfaces for signs, allow him to develop the text with a metaphorical content, including notions of density, fracturing, memory, and shadows as ephemera, among others. 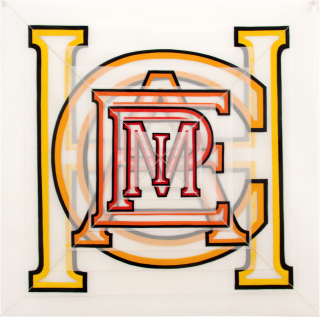 Joe Amrhein was born and raised in Sacramento, California and worked as an artist and sign painter in San Francisco and Los Angeles before moving to Brooklyn in 1989, where he currently works and lives. 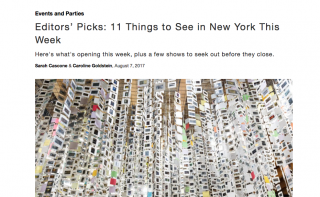 His work has been exhibited in the US and Europe in solo and group exhibitions at Yossi Milo Gallery (NY, NY), Jochen Hempel Galerie (Berlin, Germany), Städtische Galerie Wolfsburg (Wolfsburg, Germany), Leytonstone Center for Contemporary Art (Leytonstone, UK), and The Berman Museum of Art at Ursinus College (Collegeville, PA). 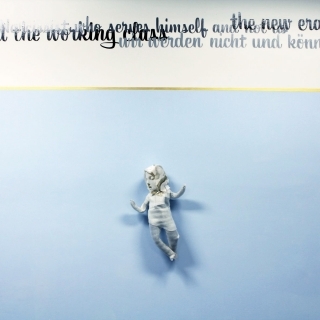 Amrhein is also founder and co-director of Pierogi Gallery. 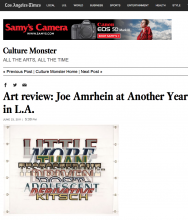 ART REVIEW: Joe Amrhein at Another Year in L.A.